June 16- it was a great p-day! We were suppose to get a 2 week missionary this morning but last night we got a call letting us know that she is home sick and wont be able to make it :( we were super sad to hear that cause we were super excited to have her. the chaffey YSA sisters invited us to spend the day with them. Sisters Crowley and Cromwell are so funny and just fun to be around. they picked us up and we went to the library to email. after we got lunch at Wendy's and ran into some members. they are out here doing summer sales, it was fun talking to them. then the sisters washed their car and we all went to Wal-Mart to shop. by this time it was time for zone activity! we played ultimate ball and i dominated!! i love that game, maybe cause i can actually play this one! haha the sisters dropped us off at home so we could eat dinner. after we went to the Swarts and saw potentials and less actives in that area. overall it was a fantastic day! June 17- This morning we had district meeting. its our first one we have had with Elder Rudolph. it went so well! He is one fantastic district leader. we talked about developing Christlike attributes and why it is so important to do so now especially as missionaries. the spirit was super strong and we all learned many things through it. after the meeting we all stayed after and had district/ zone lunch. it was fun. Sister Bond made her biscuits and gravy for everyone. when we got back to our area we went and saw potentials in area 11. we met this guy named Alex. he is an older gentleman and is really nice we talked with him for about 10 minutes at his door. 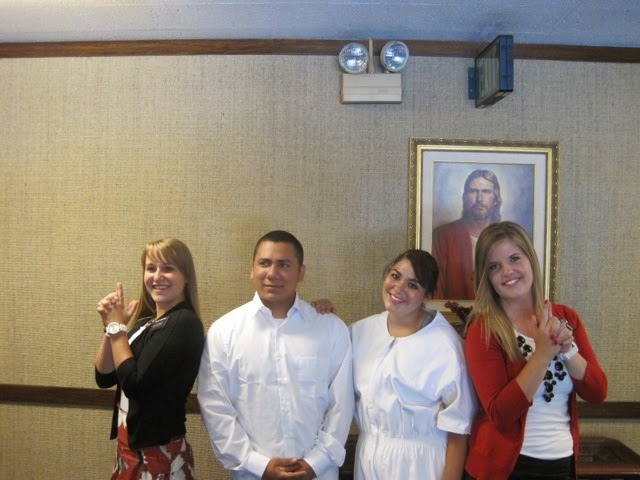 he asked us why we don't speak Spanish haha Sister Dunford then spoke the little Spanish she knows and he was impressed. we tried to share a scripture with him but he said if you come back and share your message in Spanish he will listen. we tried to have the Spanish sisters on the phone to do it but he wants us actually Sister Dunford to do it haha she is determined to do it! we then headed to our lesson with Jazmin. we were able to teach her endure to the end. she is so excited about her baptism and so are we! we didn't have a dinner appointment so we went out with Jazmin to a pizza place. it was so much fun! it felt like we all have been friends forever. we found out that the owner is a member not super active but we talked with him for a little bit and Jazmin invited him back to church. she is already a great missionary! after dinner we went to the Remington s to have a lesson with Miguel. we talked about the Book of Mormon with him. Miguel wants to know more about Joseph Smith before he reads it. he also was talking about how he feels at the Catholic church and says he feels more comfortable there. of course he does, he has grown up that way. change is always uncomfortable at first. pres. Remington invited him to come to church and live the commandments before he makes his choice. it was a good lesson but it made me sad to hear that he feels that way. His heart and mind didn't seem as open as before he began this journey. I know this church and gospel is what he needs but agency is real as well as the adversary ugh!! we had to leave Miguel's lesson early to get to our next appointment with Marcel. The YSA sisters, Crowley and Cromwell, came again. Marcel wasn't there but sister Dunford asked if others would like to hear the message. the girl at the door, Makala, agreed. she is 16 years old and super sweet. we were able to teach about the plan of salvation. she loved it. she was always nervous about death but this helped her know that death isn't the end. Makala agreed to continue to learn more! we are so excited! we got on the subject of math and how she is taking a summer class for it. she said she doesn't get it so Sister Dunford offered to help her. They did that for about a half an hour. Mary, Makala's mom came out of her room and saw that. she was so happy and thankful that we came over. she then told us she likes us very much and liked the way we teach. she heard the lesson we had with Marcel. the spirit is working on Mary! wow what an eventful day! 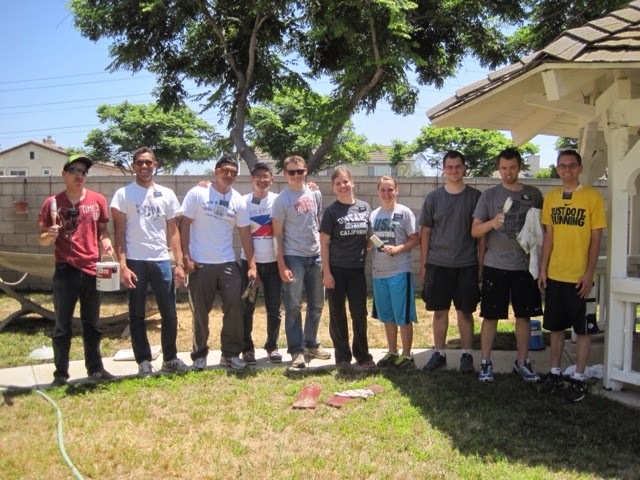 June 18- this morning we had a district service project at Sister Warner's home, from our ward. it was super fun. 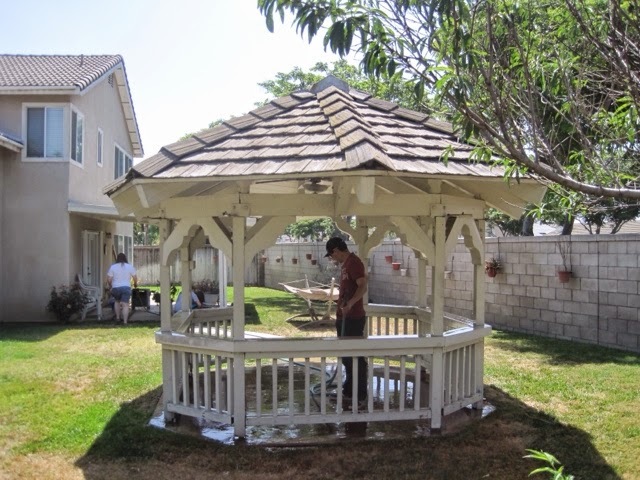 half did yard work while the other half of us painted the gazebo (sp?) of course i was painting! we were there for a few hours and then we left to go and get ready for the appointment we had with Christine. we came home and showered fast and biked over there. we were able to teach her about young women's and the standards the church has. she loved it cause she has 3 girls and wants to raise them with good standards. we gave her for the strength of youth pamphlet and she loved it. she cant wait to read it. after we went and visited with Sister T until our dinner with Socorro. Justin her husband was home so he was able to talk with Sister Dunford about shooting. he was training for the Olympics too. we went to dinner and guess what was on the menu for that night?! COW TONGUE!! yep, i ate cow tongue tacos, and really liked it! we were able to share a Mormon message with her husband who is less active, he enjoyed it. it was about prayer. we then headed back to our place and had a lesson with Makala. during that lesson we were able to find out that she is friends with a solid young woman! Xacha is 16 and is preparing for a mission so we know she will help Makala a ton. June 19- we had service at Sister T's this morning. we did yard work for her and then chatted in her room. she was having bad pains so she was in bed but wanted to talk with us. it is always fun talking with her cause she gives us advice all the time. after we stopped by Dawn's to see her daughter Grace who just got here for the summer. Dawn had a friend over and we were able to talk about the church and what we do as missionaries. it was a great quick visit! we had dinner with the Bladh family. they made us homemade pizza, it was delicious. the YSA sisters called us after and asked if we went to see a few less actives in our ward who should be in the YSA branch. we stopped and saw Lina hoping to visit with Craig but he wan't home. he was at the Reserve. it was still a great visit. we then stopped by the Belmont family cause they have a less active son. we met with him and his girlfriend and had a great lesson on faith. the night ended perfectly! June 20- we were able to do mormon.org before weekly planning at the church with the zone leaders and the Centennial sisters. weekly planning was fun! I never thought those words would come out of my mouth haha we got "stuck" with Elder Ercanbrack haha no just kidding! I was able to learn many things from him. we were able to get Jazmin's baptismal suit for her to try on. we went to Jazmin's after and it worked perfectly! she was so excited and showed her family what she was getting baptized in haha it was cute! we then had to book it home to have dinner dropped off to us. the rest of the night we finished weekly planning. June 21- Today is the big day!! eeekkk!! we are so excited! before the baptism i was able to get my hair colored. a member in my ward asked if i wanted my hair colored and of course i said yes before even thinking about it. she called her hair dresser and got me an appointment at her home. she was a super sweet lady and not a member so we were able to talk to her about what we do as missionaries. she had a lot a respect for what we do. my hair is fixed! yay!! the members in this ward take care of us! I am so lucky to be serving here. we rushed over to pick up the programs and raced home so i could finish my hair and get ready. we rode with Jazmin and Ivan to the stake center. Brother Swart and the elders were there and the font was filling up. Jazmin saw the font and got super excited! we took pictures and welcomed everyone. Jazmin's dad and brother came to support her. Ivan's mom and sister came as well. Ivan's side are members too so they were super excited about it. we then were able to have two of our investigators come, Miguel and Anthony. as well as Dawn's husband and daughter Grace who aren't members either. It was Miguel's second baptism and he enjoyed it. it was Anthony's first one and he was asking many questions yay! the bishop was able to sit by him the whole time and answered the questions he had. the ward members who came really fellow shipped him! the baptism went better than i could imagine. Sister Dunford gave the opening prayer and Sister Swart gave a talk on baptism. Ivan was able to baptize her!! Such a sweet and tender moment. I was able to help Jazmin in the back. she was beaming! while they were getting ready everyone watched mormon messages that Jazmin requested. after Zach Swart who is 11 gave a talk on the Holy Ghost and then Jazmin bore her testimony! she wrote it out and read it. she started to cry and looked over at Sister Dunford and I for support, that's when i couldn't hold back my tears. the spirit was so strong and my heart was so full at that moment. after we sang a closing song and i gave the closing prayer. we had a potluck after so everyone stayed and mingled for a little bit. it was great and so much fun. we were able to go out with Ivan and Jazmin to this Mexican smoothie place. they both got this slushy thing that was mango and covered in chili pepper and hot sauce. Jazmin had us both try it. it was DISGUSTING!! oh boy sister Dunford and i hated it haha they thought we were crazy. we got a smoothie that was safe and really yummy! we went back to their house and chatted and looked at pictures and just had a blast! i am so happy for Jazmin as well as Ivan! i am so grateful to have them in my life. June 22- Happy anniversary Mom and Daddy!! today was great! Jazmin was confirmed a member of the Church today! she loved every minute of it and her blessing was amazing. she had Brother Swart do the confirmation for her. the sacrament talks were on subjects Jazmin wanted to learn more about. that was no coincidence and she knew that. Jazmin was able to stay the whole time yay! she loved every minute of it and loves the ward so much. this ward made her feel loved and welcomed. after church we got a text from our investigator Marcel. he needed a ride home. he was living with his friend but couldn't stay there anymore. we were able to call Bro and Sis Swart and they came and got us and we drove to Holt and Campus to pick him up. he is at an extremely low place in his life right now. we know the gospel is what he needs and he is start to see that too. the YSA sisters came after church and we were able to have a pass off lesson. his desire is there and he is excited to meet more people his age at the branch. we know this is what he needs right now, he needs his Savior. we had a great dinner with the Birdsall family! it was a perfect ending to a crazy day!! This week was such a blast! i love being able to be apart of peoples journeys! I know this church is true with all my heart! i know that Heavenly Father loves us so much and that is why he sent His son. For us all! I know this gospel brings us true happiness. I have seen it in my life and in the lives of people i have been blessed to teach! I love being a missionary with all my heart!! Love you all so much! thanks for the support! Have a wonderful week! 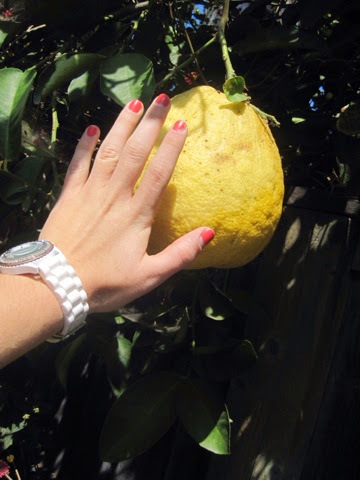 this huge lemon in the backyard of where the service was! crazy! !